Very sweet and adorable card, Julie! 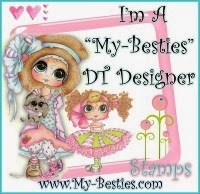 Love the DPs and pink gingham. Such a sweet card. Love the DP. I love this Tilda and lamb Julie. you have done a super job on the background and your coloring is very well done. Wow what a beautiful card!!!!! Julie, what a gorgeous card! I love this image, and your coloring is beautiful! Love the papers too....perfect! I looked at all your cards. Love all of them! Just beautiful. I'm so very sorry for the loss of your daughter. Ohhhhh, this is so darn cute!!! Love your coloring of Tilda! Absolutely gorgeous!!!!! Wonderful details and papers as well! I really like this card and the papers your used are so pretty with Tilda and her lamb. You did a great job on them, the coloring is so perfect. Oh Julie this is simply gorgeous. Fabulous DP's and the pastel coloring is beautiful. Love your coloring and embellies. This is adorable. I haven't seen this particular stamp. I love it. Lovely card,the papers are wonderfull. Fabulous colouring and love, love the papers you have chosen, absolutely delicious!! This is just too precious! I love your colors and the coloring...the layout is wonderful...everything is just so beautiful! Julie this is soooo sweet. I think Tilda's favorite color must be pink. Your coloring is absolutely gorgeous! Julie, I love Tilda as a Shepherd. 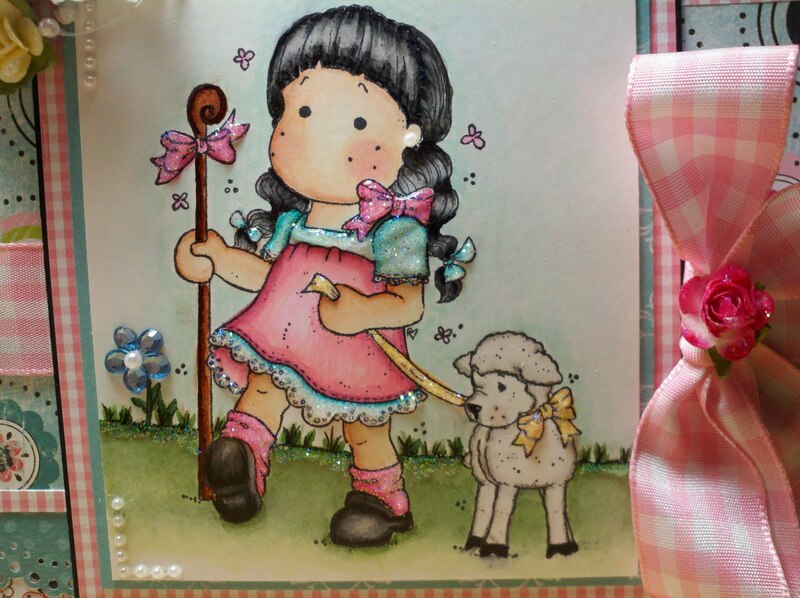 And the little lamb is so adorable! I love how you've colored her and the different DPs you've used. congrats! 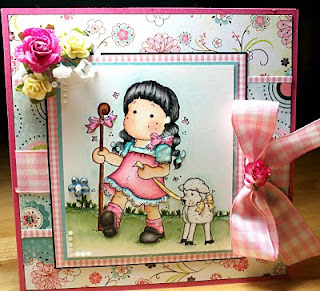 Beautiful coloring, scene and card.